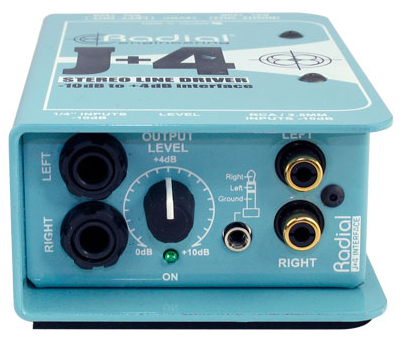 The Radial J+4 is a stereo interface designed to accept consumer level -10dB unbalanced high impedance signals and convert them to +4dB balanced low impedance signals for easy manipulation in professional level environments such as broadcast, recording studios and live touring. Careful attention has been paid to eliminate noise by combining the advantages of active signal buffering with transformer isolation. The J+4 delivers better than 95dB signal to noise while ensuring hum and buzz caused by ground loops along with spurious noise from clocking does not pollute the signal path. Controls have been kept to a minimum. This includes a stereo level control, high pass (low cut filter) and ground lift. A selection of input connectors include a stacked set of ¼`` jacks for DJ mixers or keyboards, RCA's for CD players and a mini 3.5mm for I-pods. As with all Radial products, the Radial J+4 is built tough to handle the extreme rigors of professional touring. A unique 14-gauge steel I-beam inner frame ensures the sensitive PC board will not be subjected to outside stress which could potentially cause solder joints to fail. An innovative book-end outer shell creates protective zones around the sensitive controls, switches and connectors to further improve dependability while a full bottom no-slip pad provides both mechanical and electrical isolation. 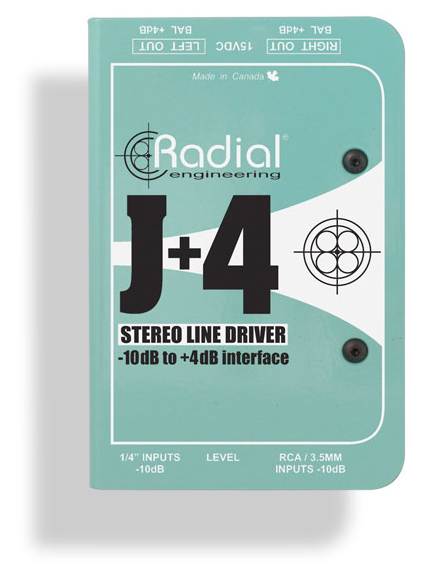 The Radial J+4 balanced line driver delivers exceptional sonic performance, plenty of headroom and ultra low noise making it the ideal companion in today's more demanding professional audio systems. 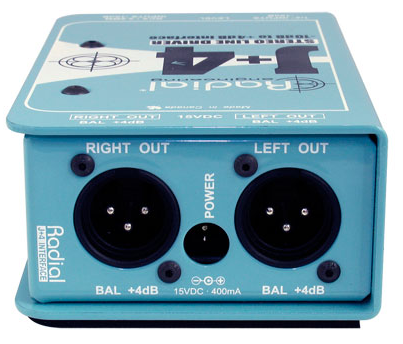 Stereo -10dB to +4dB interfaceTransformer isolated to eliminate noiseGreater than 100dB of dynamic rangePlug and play easy to use.